The range of Pneumatic Valves & Manifolds from RS Components includes control valves, manifold bases, solenoid coils and repair kits from top suppliers such as SMC, Bosch Rexroth, and Norgren. Manual control valves – Allow for the manual control of air flow around a pneumatic air system. They can be used to control the flow of air in one direction but not another, in a pressure relief situations where pressure needs to be dissipated outside of the system or to control the amount of air which is passed around the air flow system. Manual control valves are available in a number of control methods from knobs, levers to foot pedals. Control valves are as modular meaning that multiple valves can be used in conjunction with each other to create various different combinations of flow. Solenoid valve connectors – In simple terms solenoid connectors are a devices which actuate a pneumatic valves by a user or control system remotely by converting energy into a linear motion which actuates the valve. Pilot-operated relief valve (PORV) – Are used to control pressure in overpressure events. The difference between these control valves and other pneumatic control valves is they use the system pressure to seal the valve, when an over pressure situation is detected they open until the overpressure event has passed, then return to their previous closed state. Pneumatic Manifolds – Allows multiple pneumatic fittings to share / connect to one single air or source. Manifolds are available in various port sizes and materials to support high and low pressure applications. 3 and 5 port valves for for multi-directional flow and dual supply applications. Suitable for use with cylinders up to 50mm bore. High flow capacity with a wide range of operators.,Manufactured with lightweight corrosion resistant materials. High quality manually operated spool valvesStainless steel spool giving long, trouble free service lifeViton sealsSuitable for positive pressure or vacuum line applications. 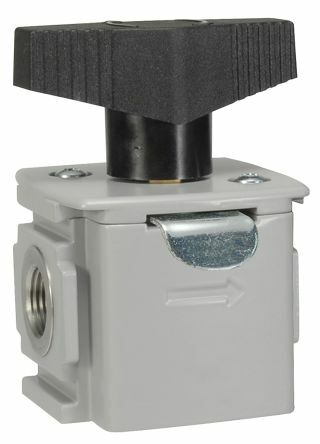 Miniature 3-port (exhaust through actuator) normally closed valves. 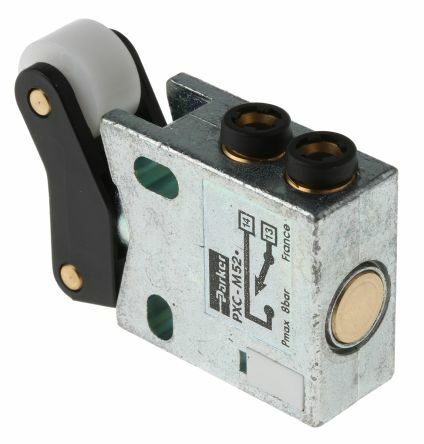 Ideal for use in space restricted working areas4mm push-in tube connectionsSuitable for use with logic controls. Ball lockout valve for Parker's P32 air preparation system. Modular design with integrated portsRobust & lightweight aluminium constructionDownstream line pressure shut off with 90° handle turnCan be locked to prevent unauthorised operation.